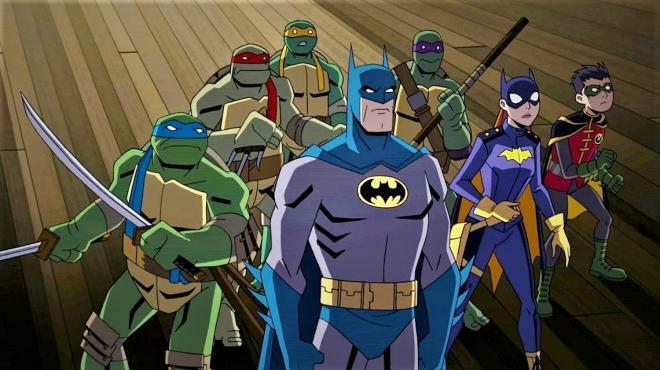 Warner Brothers and Nickelodeon have teamed up for Batman vs. Teenage Mutant Ninja Turtles, which will be available on 4K Ultra HD Blu-ray and Blu-ray on June 4 (and on digital on May 14). Other key members of the voice cast include Rachel Bloom (Crazy Ex-Girlfriend) as Batgirl, John DiMaggio (Adventure Time, Futurama) as Mr. Freeze, Tara Strong (Batman: The Animated Series, Teen Titans, Teen Titans Go!) as Harley Quinn & Poison Ivy, Tom Kenny (SpongeBob SquarePants) as Penguin, Carlos Alazraqui (Reno 911!) as Bane, Cas Anvar (The Expanse) as Ra's al Ghul, Keith Ferguson (Foster's Home for Imaginary Friends) as Baxter Stockman & Two-Face, Brian George (Seinfeld) as Alfred, Ben Giroux (Hart of Dixie) as Robin, Andrew Kishino (The Lion Guard) as Shredder, and Jim Meskimen (Parks and Recreation) as Commissioner Gordon & Scarecrow. Jake Castorena (The Death of Superman) directs Batman vs. Teenage Mutant Ninja Turtles from a script by Marly Halpern-Graser (Mad, Batman Unlimited, Be Cool, Scooby-Doo). The film is inspired by the comic book series "Batman/Teenage Mutant Ninja Turtles" by James Tynion IV and Freddie Williams II (published by DC Comics and IDW Publishing) and is based on characters from DC and Nickelodeon. Ben Jones (Teenage Mutant Ninja Turtles, Batman: The Brave and the Bold) is producer. Executive producers are Benjamin Melniker and Michael Uslan. Sam Register and Chris Viscardi are executive producers. You can find the latest specs for Batman vs. Teenage Mutant Ninja Turtles linked from our 4K and Blu-ray Release Schedules, where it is indexed under June 4.